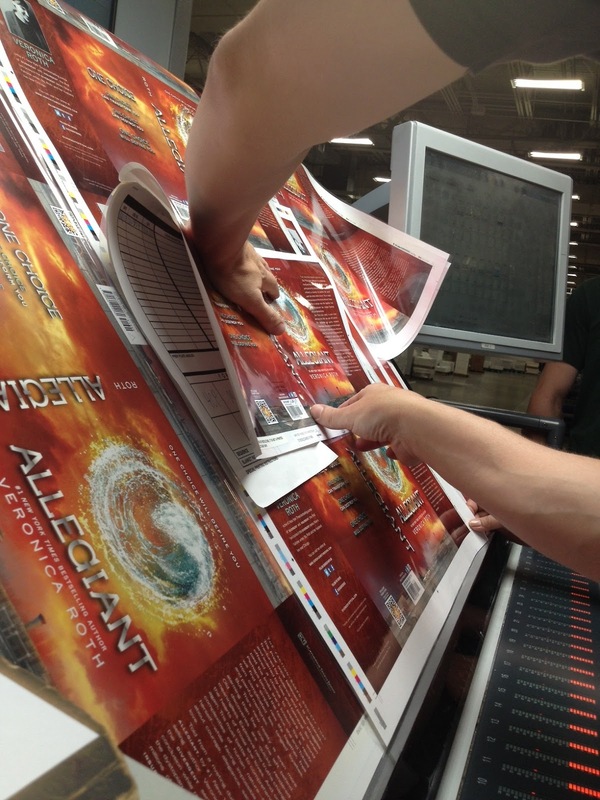 "ALLEGIANT jackets on press. Checking the color to see if it’s right for millions of copies!" "The faction-based society that Tris Prior once believed in is shattered—fractured by violence and power struggles and scarred by loss and betrayal. So when offered a chance to explore the world past the limits she's known, Tris is ready. Perhaps beyond the fence, she and Tobias will find a simple new life together, free from complicated lies, tangled loyalties, and painful memories. But Tris's new reality is even more alarming than the one she left behind. Old discoveries are quickly rendered meaningless. Explosive new truths change the hearts of those she loves. And once again, Tris must battle to comprehend the complexities of human nature—and of herself—while facing impossible choices about courage, allegiance, sacrifice, and love. 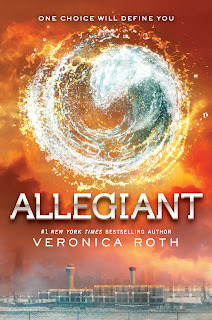 Told from a riveting dual perspective, Allegiant, by #1 New York Times best-selling author Veronica Roth, brings the Divergent series to a powerful conclusion while revealing the secrets of the dystopian world that has captivated millions of readers in Divergent and Insurgent." Oh Miles, we are so not surprised you were the ringleader in this. From USWeekly: Shooting a movie can be boring, with actors sometimes spending an entire day just standing in one spot. One good thing to come from all this free time, however, is that it has birthed the art of the "on-set prank," a little fun at the expense of costars. George Clooney does it, Brad Pitt does it, and so, Us Weekly has learned, does Miles Teller. In a recent interview, Teller admitted to Us that while filming the highly anticipated adventure movie Divergent (adapted from the best-selling series from Veronica Roth), he had a little fun with British co-star Ben Lloyd-Hughes, who plays Will. "The author of the books, Veronica, came by for a set visit and Ben kept talking about how much they had 'hit it off,'" Teller recalled. The 26-year-old Pennsylvania native plays Peter in the film. "It was kind of funny because he seemed to think that she liked him more than the rest of us, so I had my assistant run out for a balloon and a card. Then I wrote a fake note to Ben, signed it from Veronica and left it in his trailer." Along with the note, Teller left another costar's phone number, and what followed was a few weeks' worth of communication between Lloyd-Hughes and someone who he thought to be Roth. Ben Lamb, who plays Edward, told Us that it was a treat for the whole cast to watch the epic prank go down without a hitch. "I think he believed he was getting a spin-off," Lamb said. "He kept talking about his chats with her and even had scheduled a lunch which he was really anticipating." Unfortunately, the fun and games finally came to an end when the cast was hanging out in a trailer and someone let slip the fact that the texts had been from Teller all along (Lamb believes the culprit may have been Zoe Kravitz). "Ben stood up and was like, 'Is this a joke! Is this a joke!'" Lamb said with a laugh. "He couldn't believe it." Theo and Shailene talk to Vanity Fair about stunts on the set, training beforehand, and filming the ferris wheel scene. 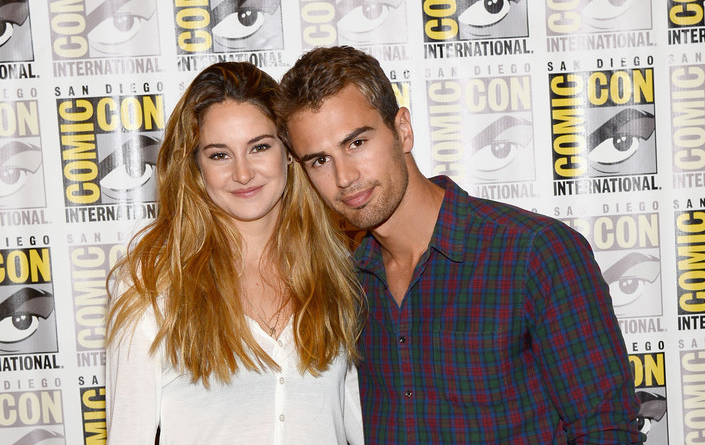 From Vanity Fair: Yesterday, Divergent stars Shailene Woodley and Theo James took Comic-Con by storm, premiering footage from their futuristic, adrenaline-fueled film at the San Diego Convention Center. 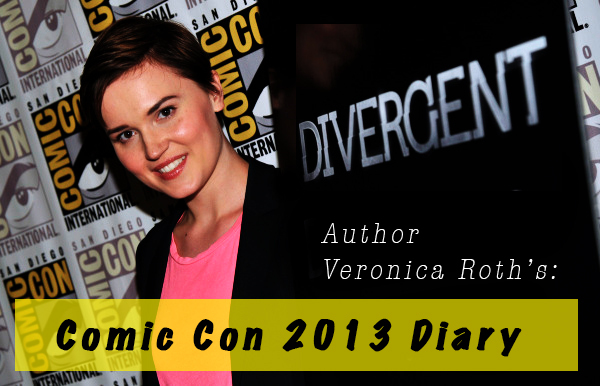 But first, the duo, who play love interests onscreen in the adaptation of Veronica Roth’s best-selling young-adult novel, sat down with your blogger to discuss the dangerous stunts they had just completed on set in Chicago. Before production began, both actors spent a month training for the physical challenges required of the big-screen adaptation, which details the grueling initiation process that Woodley’s character endures as she tries to join the “dauntless” group in a future society that divides people by their personality traits. James—the handsome British actor best known to us as Kemal Pamuk, the ill-fated Turkish diplomat who died suddenly in Lady Mary’s boudoir on Downton Abbey—did many of his own stunts, learning a hybrid style of fighting designed by the movie’s stunt coordinators and even severely injuring one its stuntmen. “I had a fight scene, which happened very quickly,” he said. “It was, like, six guys coming at me doing various things. And unfortunately, one of the guys ended up getting 25 stitches in his face, which was not great, and I felt very guilty about it.” While Woodley did not fend off six attackers on set, she did do enough of her own stunts to injure herself. “I fell off a train and got two hernias,” the Golden Globe–nominated Descendants actress recalled nonchalantly. In case you missed in during all the excitement of Comic Con, Veronica Roth made a big announcement regarding Allegiant. Mind blown. We didn't see that one coming! This is significant because both of the first two books, Divergent and Insurgent, were only from the perspective of Tris. From Veronica: "So: why two POVs? Well, I tried repeatedly to write Allegiant in just Tris’s voice, but it didn’t work; her perspective, her way of seeing things, was a little too limited for the story I needed to tell. I wanted to do two things with it: A. let two characters experience different things, and B. let them react differently to the same things, so that I (and eventually, the reader) would get a better sense of the whole story, the whole picture. I’ve said before that I’ve always seen Four (increasingly, as the series goes on) as a plot-mover alongside Tris, so he was the obvious choice for the second POV (though not the only one I tried). Exploring him and his choices and his assumptions about the world was incredibly interesting to me. It was a big challenge, it took me a really long time, and I did my very best with it. I feel confident about the way it turned out, and I hope you enjoy it! On October 22nd! AHH!" Vanity Fair: The first day of Comic-Con has arrived, and fans are already anxiously queuing outside the San Diego Convention Center for the Ender’s Game and Divergent panels, both of which promise exclusive footage from the young-adult-novel adaptations that some are calling “the next Hunger Games.” Despite the palpable excitement surrounding the films, and their career-boosting potential, Divergent star Shailene Woodley tells us that she initially balked at the idea of starring in Neil Burger’s adaptation of Veronica Roth’s best-selling novel, for which a sequel is already planned. 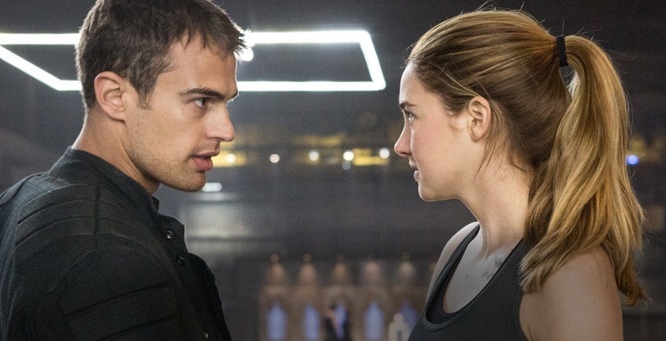 Here are the HQ versions of these awesome Divergent stills. See the rest after the cut. Click for huge full size. Another great interview. The Hollywood Reporter talks to Theo James, Shailene Woodley, Veronica Roth & Neil Burger at Comic Con about what they would do in a zombie apocalypse, plus more. Shailene Woodley at Comic con, looking relaxed as she faces photographers outside the hotel, and carrying a jar of what looks like water, but is probably some kind of awesome herbal energy restoring concoction, which she'll have needed after such a crazy day! Check the site for all the Divergent coverage from comic con. July 18 2013: Today was the day that the Divergent movie was featured at Comic Con, at the infamous Hall H. And what an amazing day it was! There was a press conference, Q&A with the cast, plus exclusive footage of the movie shown to attendees. We've spent months fangirling over even the smallest set picture featuring the cast, and suddenly we a whole ton of pictures, videos & interviews. No video of the exclusive clip shown, but there is a small 2 second preview courtesy of Summit Entertainment below. There are TONS of interviews with the cast from Comic Con, with Theo James, Shailene Woodley, Miles Teller, Ansel Elgort, Zoe Kravitz, Mekhi Phifer, Christian Madsen, Ben Lloyd Hughes, Ben Lamb, Amy Newbold, Maggie Q, Director Neil Burger, Author Veronica Roth, and theyre all included here for you to watch, plus loads of awesome pictures. The Summit Entertainment after party was held after the comic con panel. Theo James, Shailene Woodley, Miles Teller, Ansel Elgort, Zoe Kravitz, Mekhi Phifer, Christian Madsen, Ben Lloyd Hughes, Ben Lamb, Amy Newbold, Maggie Q, Director Neil Burger and Author Veronica Roth all attended. Here are some pictures, fan pictures, and video. Make sure you watch the video of Theo James dancing, its pretty epic. The Divergent Press conference took place at Comic Con before the actual panel in Hall H, with the cast of Divergent, the Director Neil Burger, and Author Veronica Roth. You can watch the whole thing below, and check out the pictures. Divergent the movie will be released in IMAX theatres! This is awesome news, watching the movie on the super big IMAX screens will be a great experience. (Press release after the jump). Also check out the new still released along with that news. Amazing shot of the ferris wheel scene, and glimpse of Tris & Four making the climb. 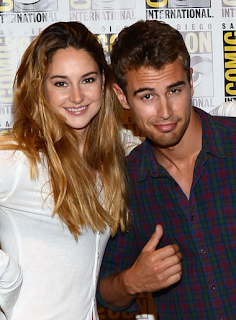 The cast of Divergent sat down with EW at Comic Con to chat about the movie. They also took some amazing portrait shots (which we really hope to see outtakes of in the future). Check them out below, along with the interview, plus behind the scenes pics and video. VIDEO: E! 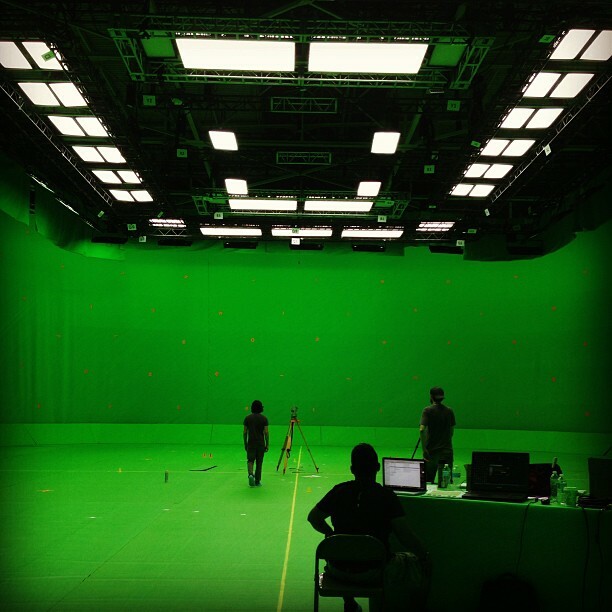 News On The Set Of Divergent: Watch Scenes Being Filmed! Most of us may not have been lucky enough to have seen the footage featured at Comic Con, but E! News aired this behind the scenes segment and suddenly we don't feel so bad! Check out the video and screencaps below! The official Divergent twitter released this new image of Four with a reminder that the first ever footage will be shown to lucky fans tomorrow at Comic Con! "Initiates, the time is near... 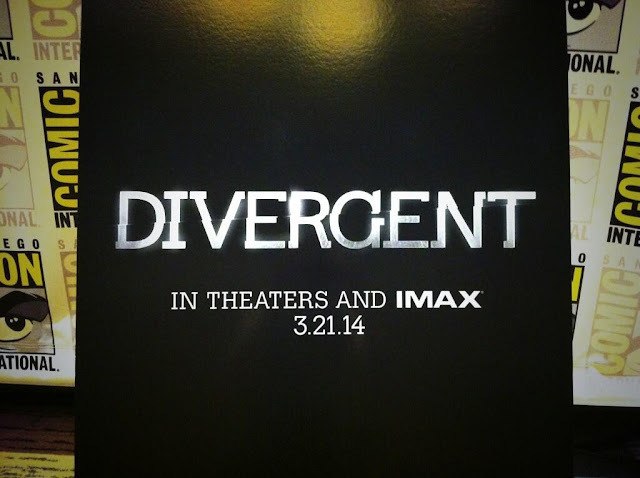 The first ever footage of #Divergent will be revealed at @Comic_Con tomorrow. #SDCC"
Filming for the Divergent movie officially wrapped yesterday. Its been great fun to follow along. A big thanks to all those who shared pictures and info and helped keep us updated. So long, "Divergent" film set. We'll do it all again for Insurgent filming next year (hopefully!). Below are a few pictures from the wrap party. 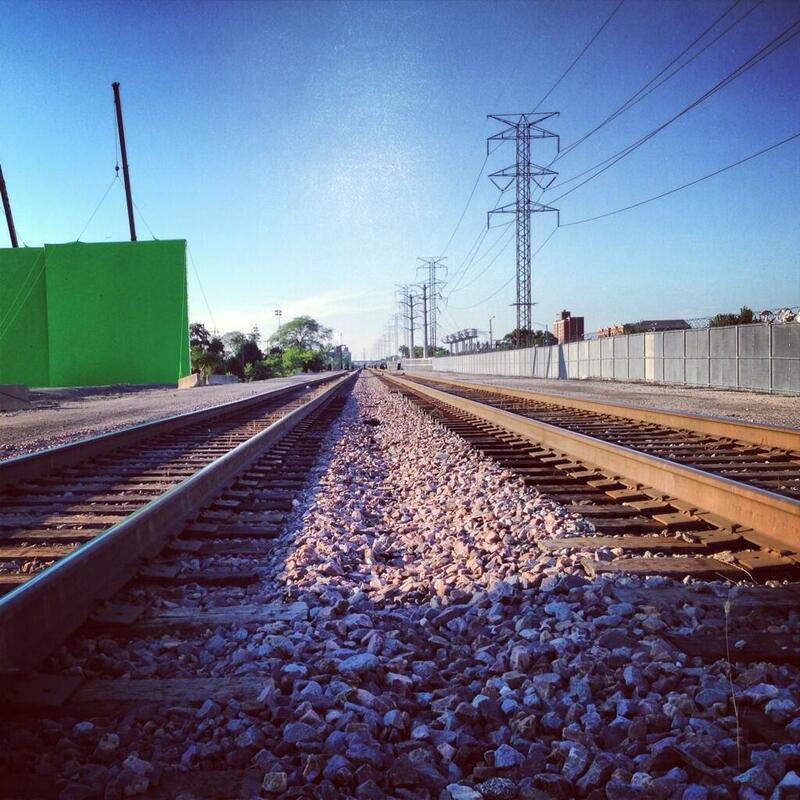 Divergent crew member toreylenart shared this picture on instagram today, of a shot from filming the day before (we think for Divergent). Could it be Amity related? Principle photography for the movie finished yesterday. "Craning the sunrise this morning #onset #technocrane #filmmaking #feature #sunrise"
We finally have our first look at Jeanine Matthews! Despite all the set pictures, Kate managed to stay pretty much unseen, and fans have been dying to see how the famous actress will look. Well here it is. And it's perfect. 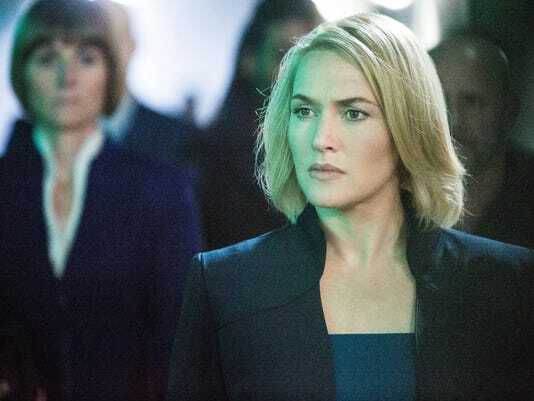 USA Today: CHICAGO — As Kate Winslet descends the stairs in the Hall of Choosing during a scene from the action-adventure tale Divergent, she carries a slim briefcase in front of her, which has multiple uses. Given that she's wearing a sharp, lab-coat-inspired executive suit, the accessory further projects the image of a true leader as Winslet's character serenely inspects the assembled masses. As soon as director Neil Burger yells "cut!," Winslet employs the container for another use — as a fan on the stifling set of Seventeenth Church of Christ, Scientist, which has broken air conditioners. As she flaps, she reveals that the case also disguises a baby bump — she announced in early June that she's having her third child, the first with husband Ned Rocknroll. Read more after the cut. MTV News crashes the set of "Divergent"!!! Check out this amazing video which includes interviews with Shailene Woodley, Theo James, Miles Teller, Veronica Roth & Zoe Kravitz. Plus a look at epic scenes being filmed. Ferris wheel scene, Dauntless training, and more! See gifs and screencaps after the cut. This is one of our favorite Divergent stills yet - so we're very happy it's now in HUGE high quality. It features instructor Four in some kind of fighting stance, with Molly in the background. 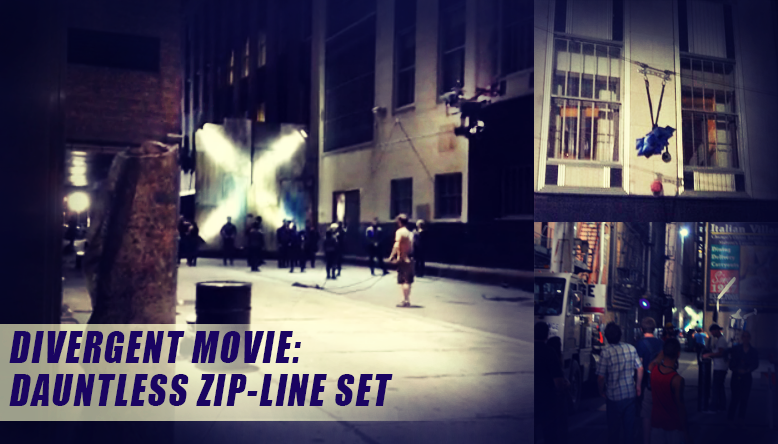 Eagle-eyed Chicago residents spotted this movie zip-line set up for the Divergent movie which was being filmed over 2 nights to capture the landing part of the stunt. The zip-line cables went from the top of a crane about 1.5 mile/2.4 km away, down to the lit-up 'X' landing spot in an alley. Cameras can be seen traveling down the cable in order to capture footage of the ride down. We didnt see an actual person being used, but Tris stunt double was present and tweeted "Time to go fly down the streets of Chicago! #Dauntless #Divergent." Dauntless extras were also seen around the set. Elsewhere, an extra shared her pictures from the set, posing with another guy and a clapperboard, and wearing a Divergent crew t-shirt. See all the pictures below. Check out this stunning, edgy new photoshoot with Shailene Woodley, along with a new revealing interview she did with Emma Stone. From Interview USA: Actress Emma Stone, who was in New York, connected by phone one late spring night with the 21-year-old Woodley in Chicago, where she was shooting Divergent, to discuss her graduation from Secret Life, her quickly expanding oeuvre, and the challenges of growing up, acting out, and coming of age—both on-screen and off. Read the full interview and see more pictures below. LA Times Hero Complex has a feature on 'The new wave of strong female-led sci-fi', which includes this new still of Tris training, and Shailene Woodley's comments on the subject matter. Its a good, interesting read, so make sure you check it out. Below we've posted mentions of Divergent and Shailene's comments. 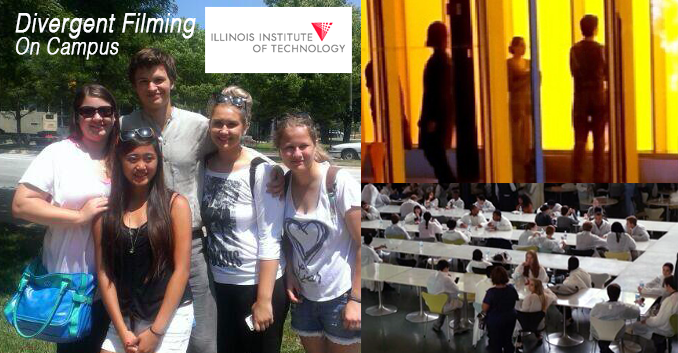 As Divergent finishes filming in Chicago, some of the last scenes are being shot on the Illinois Institute of Technology campus, expected to last until Friday-inside a building known as the MTTC. Lucky for us, a few people on the campus shared their pictures. Ansel/Caleb and Shailene/Tris are both present, and judging by the video and pictures, we think they are filming either scenes for the choosing ceremony, or another scene from the school. Ansel Elgort, sweet as always, met fans outside and posed for pictures. 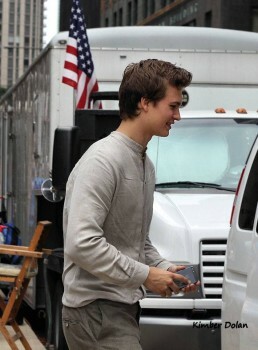 We have more awesome pictures from the set of Divergent last weekend! Get an up close look at some of the factions, and see the Prior family hug it out on Tony Goldwyn's (Andrew Prior) last day on set. More pictures after the cut. 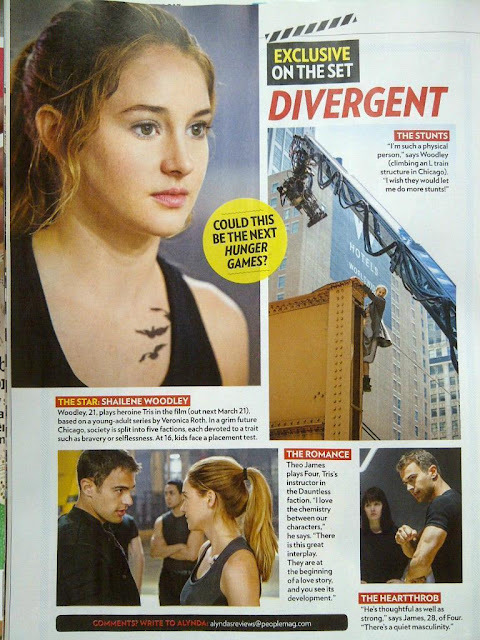 Divergent is featured in People magazine, along with 3 new stills! 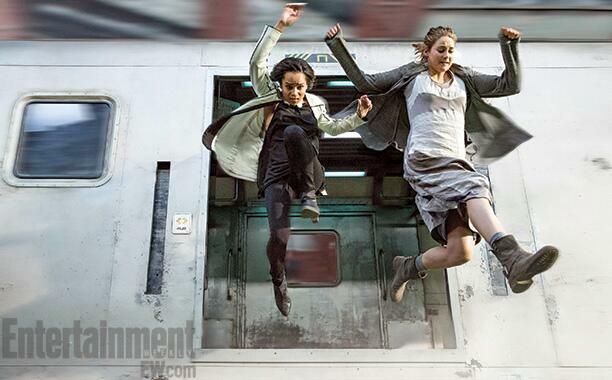 The first two, Tris close up, and Tris/Shailene Woodley looking Dauntless hanging on the edge of an L-train structure. "I'm such a physical person," says Woodley. "I wish they would let me do more stunts!" The second new still is bottom right, of Theo James/Four in some kind of fighting stance as he trains the initiates. "He's thoughtful as well as strong," says james 28, of Four. "There's this quiet masculinity." 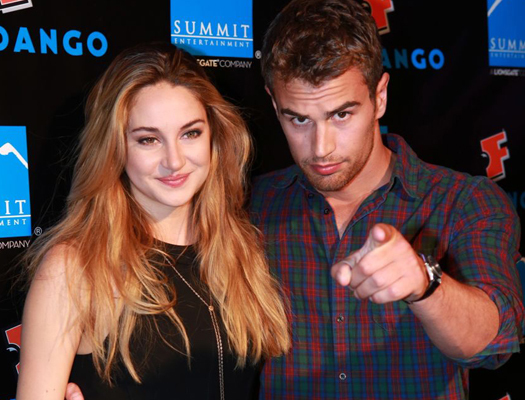 Theo on Four and Tris: "I love the chemistry between our characters, there is this great interplay. They are at the beginning of a love story, and you see it's development." Update: Added article and High-Res versions of 2 of the stills after the cut. 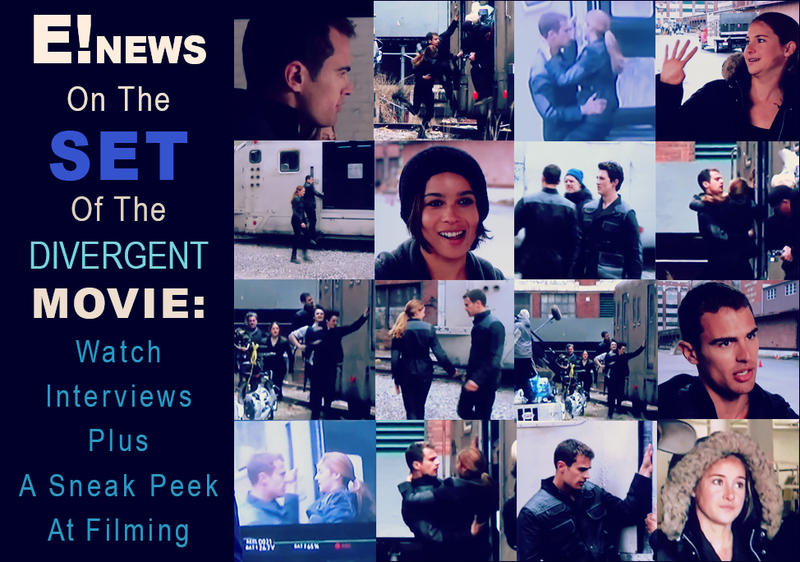 FIRST LOOK VIDEO: Entertainment Tonight on the Set of Divergent! Exciting! HarperTeen announced that this Barnes & Noble's exclusive edition of Divergent contains sixteen pages of never-before-seen excerpts from the Faction Histories that reveal a deeper understanding of daily life within the world of DIVERGENT. We cant wait to check this out! In the books, not much is known about the history of factions. This is deliberate because we will eventually learn everything as Tris does in the rest of the trilogy. The Prior men stepped out for dinner together last night, and were all smiles as they posed for pictures at "RoSal's Italian Cucina. We're guessing it was a farewell dinner since it was Tony Goldwyns last day filming. 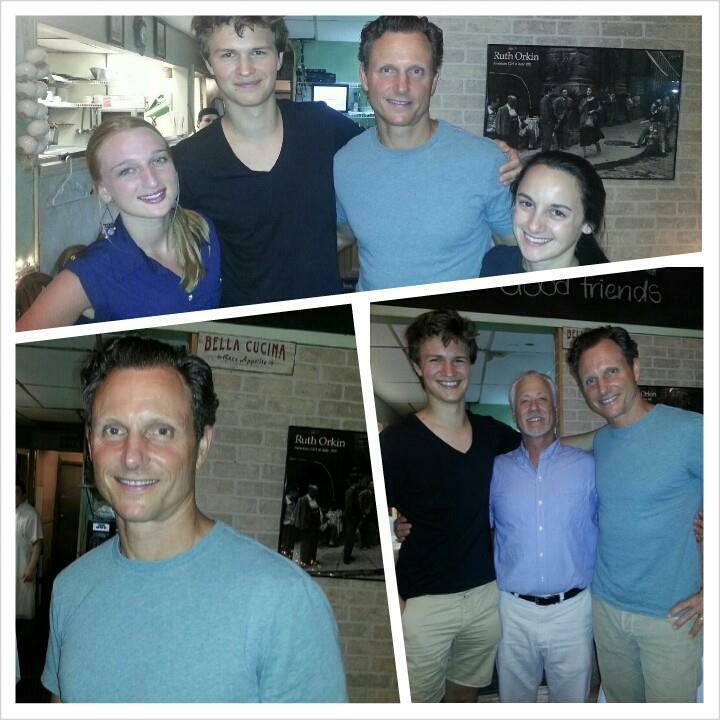 "Thank you #TonyGoldwyn & #AnselElgort for having dinner with us last night! #Scandal #Divergent"
I will also be the keynote speaker at YALLfest in Charleston, South Carolina, along with the fabulous Rae Carson, on Saturday, November 9! 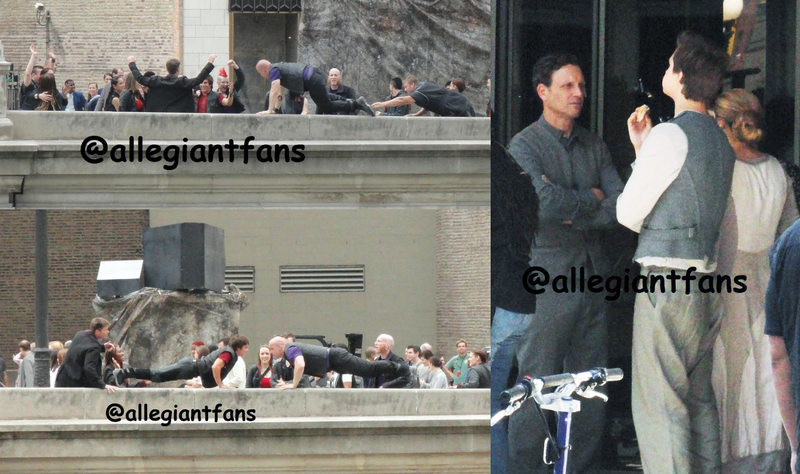 Check out these pictures by Allegiant Fans of the Dauntless challenging each other on the ledge of a bridge. The spectators were apparently cheering loudly, encouraging them. You'd expect nothing less from the Dauntless. We later heard that the scene was such a risk they didnt continue, and it likely wouldnt be in the movie - we'll have to wait and see. It does give us an idea of what kind of antics to expect however. 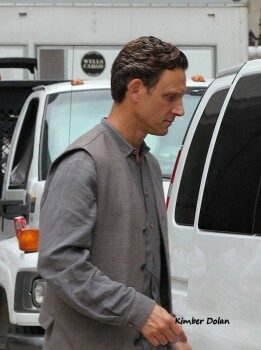 Also spotted was Tony Goldwyn (finally!) 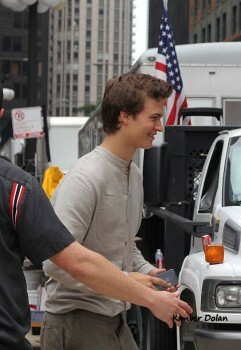 talking to Shailene and Ansel during a break in filming. More pictures after the cut. 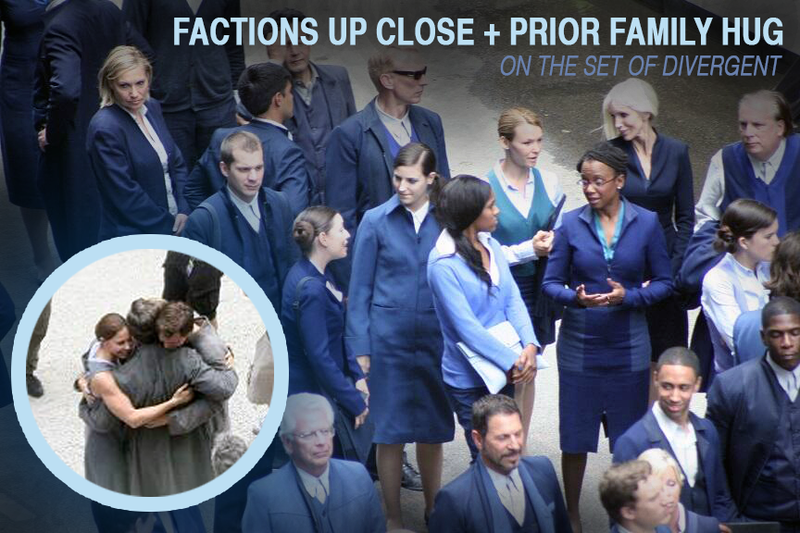 Great quality pictures of the Prior family in their Abnegation costumes on the set of Divergent in Chicago! Plus some cool behind the scenes shots, and funky looking Dauntless extras. Click for full size. Thank you to @Kimber12s for sharing! She told us "It was a lucky day!" More pictures can be seen after the cut.